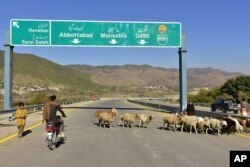 China’s plan for a modern Silk Road linking Asia and Europe hit a pothole recently in Pakistan. 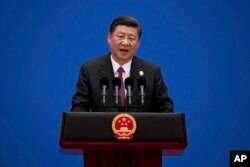 Pakistan and China have good relations; some Pakistani officials even call China their “Iron Brother.” China has played an even bigger role in the country since U.S. President Donald Trump decided last week to suspend security assistance to Pakistan. Yet, plans for the countries to build a $14-billion dam on the Indus River were put in doubt, after Pakistan’s water authority announced China wanted to own part of the project. China has denied making the demand. However, the water authority rejected China’s reported demand as against Pakistani interests, and withdrew Pakistan from the dam project. From Pakistan to Hungary to Tanzania, projects under Chinese President Xi Jinping’s “Belt and Road Initiative” are being canceled, renegotiated or delayed. Host countries have disputed costs and benefits that they would receive. The “Belt and Road Initiative” is a plan to build projects across 65 countries, from the South Pacific through Asia to Africa and Europe. Such projects include oil drilling in Siberia, new ports in Southeast Asia, railways in Eastern Europe and power plants in the Middle East. In this Dec. 22, 2017, photo, a Pakistani motorcyclist drives on a newly built Pakistan China Silk Road in Haripur, Pakistan. The United States, Russia and India view the Belt and Road initiative as a way for China to expand its influence. Many countries have welcomed plans to build infrastructure that would keep their economies growing. Nations such as Japan have given or lent billions of dollars for development through the Asian Development Bank. In November, Nepal canceled plans for Chinese companies to build a $2.5-billion dam. Officials said building contracts for the Budhi Gandaki Hydro Electric Project violated rules that require offers from numerous bidders. The European Union is also looking into whether Hungary awarded contracts to Chinese builders for a high-speed railway to Serbia without competing bids. In Myanmar, plans for a Chinese oil company to build a $3-billion refinery were canceled in November because of financing problems. In Thailand, work on a $15-billion high-speed railway was delayed in 2016 following complaints that not enough business went to Thai companies. In Tanzania, the government has reopened negotiations with China and the gulf state of Oman over ownership of a planned $11-billion port in the city of Bagamoyo. Tanzania wants to make sure its people get more than just taxes collected from the port. Even Pakistan, one of China’s friendliest neighbors, has failed to agree on key projects. Among them are a $10-billion railway in Karachi and a $260-million airport for Gwadar. A general view of Gwadar port in Gwadar, Pakistan Oct. 4, 2017. The port is at the heart of the $50 billion Chinese investment in the China-Pakistan Economic Corridor (CPEC). There is no official list of all Belt and Road projects. However, BMI Research has created a list of $1.8 trillion worth infrastructure investments across Asia, Africa and the Middle East. Despite the setbacks, Chinese officials say most Belt and Road projects are moving ahead with few problems. The state-run China Development Bank announced in 2015 it had set aside $890 billion for more than 900 projects across 60 countries in gas, minerals, power, telecommunications, infrastructure and farming. The Export-Import Bank of China said it would support 1,000 projects in 49 countries. Hai Do adapted this story for Learning English based on an Associated Press report. Ashley Thompson was the editor.